England all-rounder Andrew Flintoff has announced he will retire from Test cricket at the end of the current Ashes series against Australia. The hero of England's victorious 2005 Ashes campaign has fought a constant battle against injuries and will now concentrate on one-day cricket. The 31-year-old is currently fighting to be fit for the second Test at Lord's because of a knee problem. 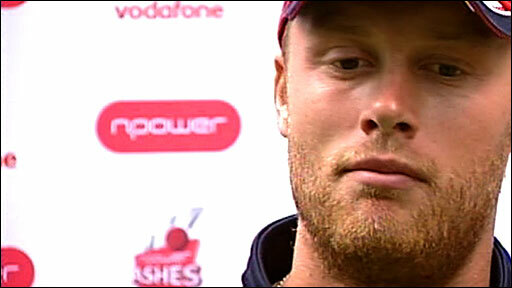 Flintoff said: "My body has told me it's time to stop." The latest knee injury flared up after the drawn first Test against Australia in Cardiff and Flintoff explained: "It's been something I've been thinking about for a while and I think this last problem I've had with my knee has confirmed to me that the time is now right. "I've been through four ankle operations, I had knee surgery just a couple of months ago and had three jabs in my knee on Monday, just to get me right for this Test, so I took that as my body telling me that I can't cope with the rigours of Test cricket. "For the next four Test matches I'll do everything I need to do to get on a cricket field and I'm desperate to make my mark." The burly Lancastrian dismissed suggestions that his impending Test retirement would overshadow the remainder of the series. "An Ashes series is bigger than any one player," he said. "The focus will be on England trying to win a special series." 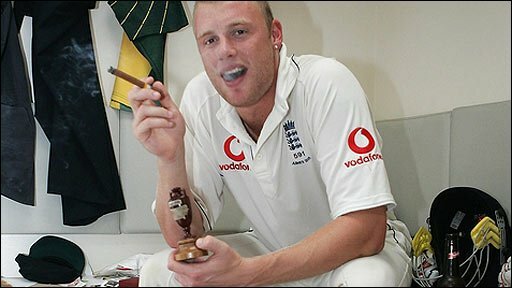 So far Flintoff has played for his country 76 times in an 11-year Test career since his debut against South Africa in a famous England victory at Trent Bridge. But undoubtedly his finest hours came during the 2-1 series success at home to Australia in 2005, a summer that resulted in Flintoff being hailed for his sportsmanship as well as his cricketing ability. After a duck and then three in the first Test at Lord's, he made half-centuries in each innings and took seven wickets as England fought back thrillingly to win by only two runs and level the score at Edgbaston - where his hand-on-shoulder consolation for a beaten Brett Lee became perhaps the iconic image of the whole series. Flintoff's maiden Ashes hundred helped bring a second home win in Nottingham and there were more runs and wickets as England regained the urn in a fifth-Test draw at The Oval. With 2005 captain Michael Vaughan out injured, Flintoff himself was to lead England in their ill-starred bid to retain the Ashes in 2006-07, a series that ended in a 5-0 whitewash. He lost the vice-captaincy under Vaughan after his drunken late-night escapade on a pedalo at the start of a notably unsuccessful 2007 World Cup campaign in the Caribbean. Australia captain Ricky Ponting said his team were "a little surprised" by Flintoff's decision, but added they will not treat him any differently for the second Ashes Test at Lord's which begins on Thursday. 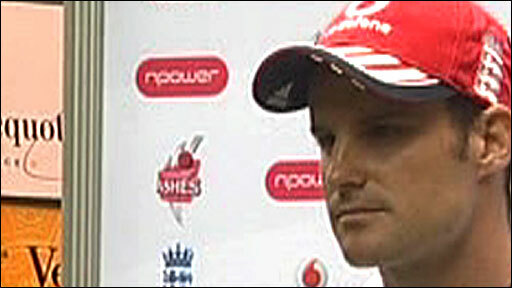 "We know how big a figure he is in the England team," said Ponting. "I think you could even see that last week with his first spell back in the Test side - the whole ground sort of lifted, it changed the real feel around the ground last week. "I thought we did a good job. We played him very well last week whether it was with the ball when he was bowling or when we had a chance to bowl to him." 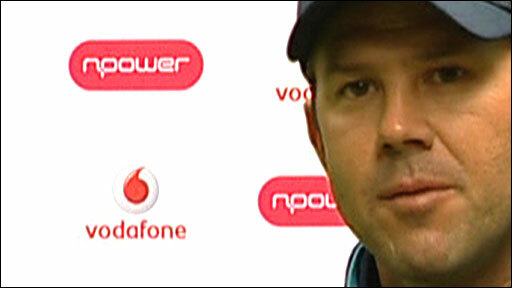 Ponting added: "He's been a great figure in the game. The way he's gone about his cricket, the way he's played the game and how much he's enjoyed the battle - probably particular in Ashes cricket - is something that's been very fun to be a part of for me." Flintoff's former Lancashire team-mate Sourav Ganguly said he was paying the price for England's over-reliance on him. "I always said England needed to balance his bowling with his batting if they wanted him to survive longer in Test cricket," said the former India captain. "With England, every time they are under pressure it is Freddie with the ball because he is their best bowler. "He's a big boy and injuries are part and parcel of sport, but there are other fast bowlers around the world who are running in and keep playing and doing well in Test matches. "I think it more about Freddie Flintoff's body than the rigours of international cricket. To be honest it's the amount of bowling he does for England." BBC cricket correspondent Jonathan Agnew said the news was not a surprise and rather than distracting England from the task in hand, it might inspire them in the Ashes. "It's interesting that he's done it now - it's been talked about a great deal and has been a bit of a distraction," he told BBC Radio 5 Live. "Now he's got it out, he'll want to enjoy his last Tests so if I was an Australian, I'd think 'oh dear', - it might be galvanising for the England camp." Some cynics have pointed out that sacrificing his Test career means Flintoff is saving himself for the more lucrative limited-overs formats but Agnew said Flintoff was not being selfish. "There's a very lucrative one-day league - the Indian Premier League - for which he's now fully available," he added. "They're paid per match, so if he goes and plays the whole thing, he picks up all the money. "But I'm not cynical, he's been on the bench for the last couple of years and England need to know what's going and build for the future. If he does have problems with his fitness, that uncertainty is removed from their planning."